Many people have heard of the online mattress retailer and manufacturer Leesa. They’ve recently launched a sister company to get into the hybrid mattress business. 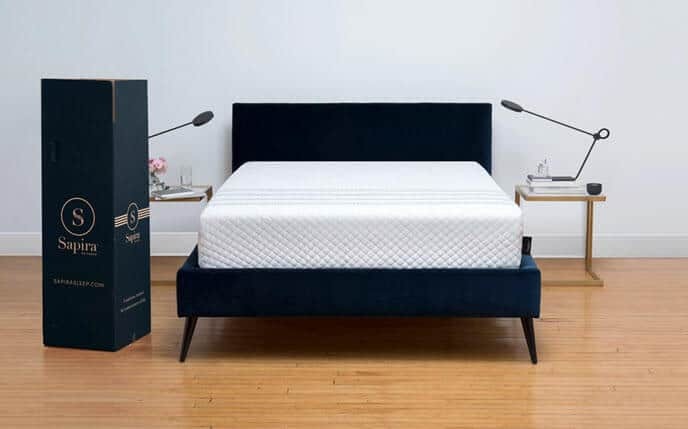 The result is the Sapira, a hybrid mattress intended to be appealing to many different types of sleepers and that is targeted at the luxury end of mattress sales. This is a big transition for Leesa, so read our full review below to see if they manage to meet their ambitious goals. Should I Buy the Sapira Mattress? The Sapira is a hybrid mattress that is made from 5 layers of foam and coils. It is a total of 11” thick and uses a number of different materials and technologies in its construction. The combination of foams and coils is an effort to get the most out of the properties of foam while at the same time getting the bounce and support associated with traditional coil or innerspring mattresses. Top – the top layer is made from 1.5” of high density foam. It is designed for comfort and cooling. The foam is a poly foam that works to distribute and remove the heat created by the sleeper, and also offers the initial comfort and fast response that you expect from a high quality mattress. Moreover, the quick response of this material helps prevent the sinking feeling that some people report when sleeping on foam mattresses. Second – the second layer of the Sapira is engineered to offer contour and pressure relief. It is made from 1.5” of memory foam. Putting the memory foam as the second layer does a good job of allowing sleepers to enjoy the contour and hug it creates without letting collect and trap the body’s heat. Third –the third layer is made from 1” of transitional poly foam. It acts as transitional support as the sleeper eases into the deep compression support of the bottom layer and the coils. The thickness of this layer is good for transitioning the body to the coils below from the memory foams you find above it. Fourth – the fourth layer is made from 6” of pocketed coils. These coil units are some of the most advanced sleep technology on market today. They create zones of support to give the sleeper’s body where it’s needed, while letting other parts of the body relax and enjoy the softness and comfort of the foam. Another benefit that you get from these coils is that they include units designed specifically for edge support. This can help spice up adult playtime activities and also helps you feel like you’re securely on the mattress if you’re an extreme edge sleeper, instead of feeling like you’re going to roll off or be thrown off the mattress like you get in some other options that lack this type of edge support. Bottom – the bottom layer acts as the foundation for the rest of the mattress. It is constructed from 1” of poly base foam. It helps to support the coils above it and buffer the rest of the layers. 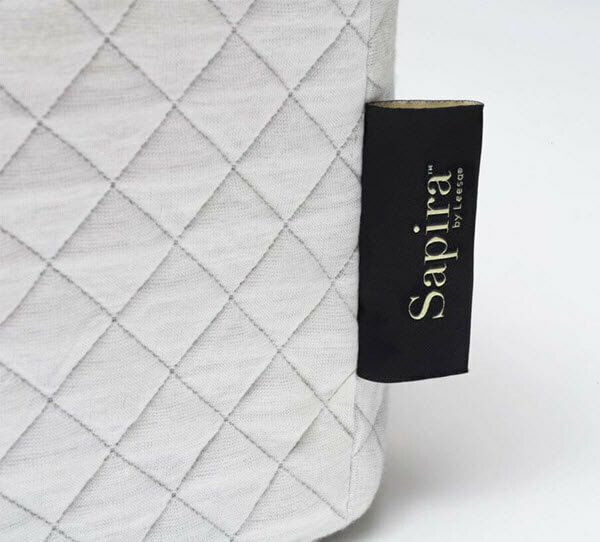 One unique element of the Sapira is that the cover is cut from a single piece of fabric that surrounds the entire mattress. It is made from a poly-Lycra blend. The result is a soft and stretchy cover that has great airflow. The cover feels very durable and has the touch of quality to it. This material is also used in many high-end athletic wear and other sports accessories. The cover has a similar look to the one you find on the Leesa. It is white with a quilted diamond pattern and has four grey bars running by the foot of the bed. Each of the bars has a unique geometric pattern, which helps give the mattress a sharp look. All in all, the cover is good, but not great. No one really worries about the cover as a make or break element to a mattress though, as it is usually covered by sheets. The most important thing for a cover is the softness and breathability, and that’s a place where this mattress does well enough. On a scale from 1-10, with 1 being the least firm and 10 being the most firm, the Sapira comes in at a 6.5. That puts it at the top end of the middle-firmness range, which will still be enjoyed by most sleepers. However, much firmer than this and you will start finding people who find the mattress too firm to be comfortable. It’s important to note that when you first set the mattress up it may feel a bit more firm because it is still decompressing from shipping, and will soften up as it finishes expanding and filling out its full form. When it comes to hug and contour, the Sapira offers a unique experience that you don’t normally see. The memory foam and coils work together to allow a slight contour and hug, but the coils push back enough to prevent any kind of sinking or enveloped feeling that you can get from purely foam mattresses, especially memory foam. This creates a balance between support, sinkage and comfort that isn’t found in many other mattresses we’ve looked at. Additionally, the Sapira matress does a good job to balance support and material stability. This is why it has such great edge support, and why the amount of sinkage is just right to cause pressure point relief without being excessive and trapping you in the mattress. Furthermore, the zoned coils provide excellent support for stomach and side sleepers, which speaks well for the design of the comfort zones the mattress uses in its design. Back sleepers will also get the support they need, which makes the Sapira a good choice no matter what kind of sleeping position you prefer. While the Sapira is factory tested to support sleepers up to 350lbs, the design can probably support more, which makes it appealing to many heavier sleepers who struggle to find a coil or memory foam mattress that can offer the type of support they need the most. We’ve already mentioned that the Sapira has great edge support, and it’s actually among the best mattresses on the market in that regard. This enhanced edge support is great for people who like to sleep on the extreme edge of the bed, as it means they won’t feel that they’re about to roll off the mattress. It’s also good for adult activities in bed, and can help liven up a relationship. Another relationship enhancing property of this mattress is the bounce that it provides. Most memory foam mattresses are low on bounce, and that can make adult playtime more work than it otherwise would be on a traditional spring mattress. The bounce does create a bit more motion transfer than you’d expect from memory foam mattresses, but it’s not enough to really disturb a partner by getting into or out of bed or by rolling around and changing position in the night. We do sinkage tests on all the mattresses we review. These tests are designed to give you a better idea of how the mattress will perform in real life conditions and give you a clear picture of what it will be like to sleep on the mattress. Our tests are conducted by an individual weighing ~140 lbs, so your results might be a bit different from the ones we measured in our tests. Laying on Back – laying on the back in a normal sleeping position with the weight evenly distributed produced 1.5” of sinkage. Laying on Side – laying on the side in a normal sleeping position with the weight evenly distributed created 2” of sinkage. Full Edge Sit – resting the full body weight on the mattress while sitting on the edge caused 3” of sinkage. Standing in Middle – standing in the middle of the mattress with both feet planted and flat caused 4.5” of sinkage. Shipping – the mattress ships free and will arrive at your door compressed into a box in 4-10 business days. 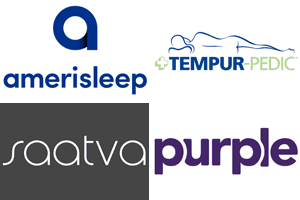 Trial – sleepers get 100 nights to decide if the Sapira is right for them. Many people will enjoy the Sapira mattress. 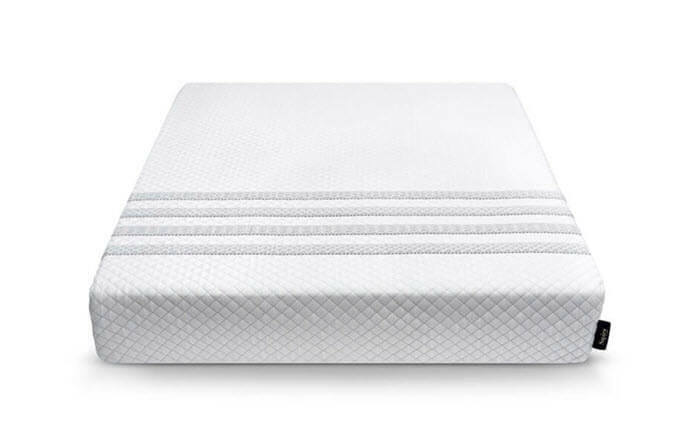 It offers a medium to medium firm feel and does a great job of combining the best qualities of memory foam with the comfort, support, and bounce of a coil system. The coil system they use is one of the most advanced on the market, and it has some of the best edge support we’ve seen. That means it’s also a good option for people who are looking to spice up their relationship or try out some new activities during adult-themed fun. The Sapira will also be appealing to people who want to buy from a company that gives back to the community. Leesa, the sister company to Sapira, is well known for the donations they’ve made since their founding. They have donated more than 6,000 mattresses, and they donate another one for every 10 mattresses sold. On the whole, the Sapira is an excellent choice for most sleepers. It is a quality mattresses that does a good job at addressing everything that someone could want in a mattress without engaging in some of the less desirable qualities of the materials they use. It has great response, cooling, and comfort, and is definitely worth checking out for lots of people.